Most parents know how important it is to read to their young children. It’s not only important, it’s fun! I remember great moments with both my children (they were two years apart) sitting on my lap in the big chair. We read every day, always before bedtime and often at other times as a special treat or as a way to calm the kids down after a hectic play session or a sibling squabble. Most young children love to own books, to get books out of the library, to imitate reading by turning the pages of a picture book and either repeating the memorized text or making up their own story to go with the picture. Why then do we have so many NON-READING HOUSEHOLDS? Why are there so many teens and adults who CAN READ but DON’T? These were described by Jane Healy, author of Endangered Minds as a-literate not illiterate. Their reading skills are just fine but they do not chose to read. Or they read only what they need to read for school or work. They get their news and entertainment from TV or the computer but they do not read newspapers, magazines, or books and have not been to a library for years. Many of these a-literates are super intelligent creative people who spend lots of time at the computer. Alas, I suspect that many young children, the very ones who love libraries and books are living in non-reading households. These children never see their parents read. And when they are old enough to read to themselves they don’t because they emulate their parents. So I boldly suggest it’s not enough to read to your children. You should raise them in a reading household. 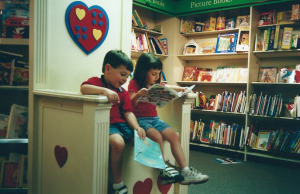 A reading household has books for both parents and children. The morning newspaper is delivered daily even though the parents may be too busy to read it until nighttime. At the library both parents and children check out books. A reading household sets aside time for a FAMILY READING HOUR. Everybody sits down together with a book. All TV sets, music or other noise makers, and cell phones are turned off. The parents start by reading a book to the little ones. They progress from picture books to chapter books. Many continue the reading aloud long after the kids can read to themselves. And eventually the whole family takes turns in reading aloud with emphasis on diction and expression. This is followed by silent reading –even toddlers can pretend to read and delight in imitating their parents turning pages. As the children get older they can choose the books to be read. Some families have each child present a choice and they vote. Sometimes the parents choose a book based on a current event or a lesson they feel their children should learn. One family read the privately-printed diary of a great-grandmother who was a pioneer rancher to give the children precious information about their ancestor and her brave decision to run the ranch alone after her husband died. The family reading hour accomplishes a lot. It models reading behavior for young children. It is a time of quiet togetherness in perhaps an otherwise hectic household. It is a time of education, a time of social interaction, a time of enjoying a story together. The social interaction is different from watching TV or playing a computer game together. No noise except the human voice, no flashing or flickering lights, you look up from the book at each others faces not a screen. This can be the most peaceful time of your day. To me the reading hour represents much more than an educational experience for your children. Try it! Busy household? Just 20 minutes a day will work.